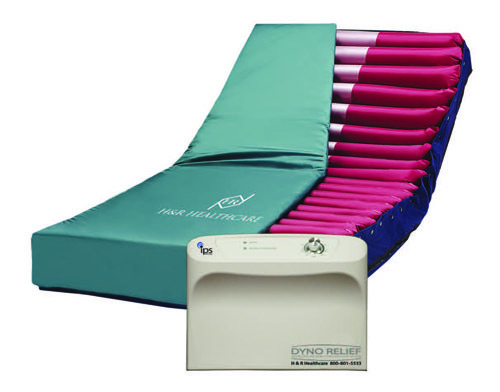 The Dyno Relief is a powered alternating pressure / low air loss mattress replacement system designed to aid in the prevention and treatment of Stage I – IV pressure ulcers (E0277). The unique Intelligent Pressure Sensing Technology ensures maximum pressure relief and incredible clinical results. The mattress is configured of 20 deep air cells with support which maximizes surface contact area and weight distribution. Alternating Pressure relief massages the epidermis while continuously changing contact points with the skin’s surface to provide ultra low pressure to over 50% of the surface area. Ultra low pressure helps support healthy blood flow, tissue oxygenation, and nutrient and waste exchange. The system contains low air loss for heat and moisture displacement. The pump has a turn/lock dial which can be adjusted to individual patient’s weight to ensure comfort and to aid caregivers.